On the back you can see a picture of Pooh holding Piglet and some balloons, and that’s what the front picture is supposed to be, too. 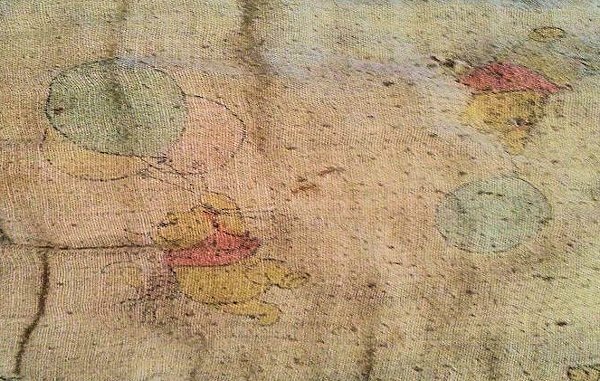 I’m looking for a 1998 Winnie the Pooh and Piglet crib blanket that came with sheets and a dust ruffle. It had Pooh and Piglet holding balloons. The material was cotton. My 15 year old daughter was given this blanket by her much loved aunt when she was born. Over time this blanket has deteriorated to almost nothing. This blanket is her security and comfort. Unfortunately, my daughter has been diagnosed with cancer, and all she wants while she recovers from treatments is to have her blanket by her side for comfort. The smell, the feel of the blanket gives her comfort and basically wraps her in a hug. I can’t explain how it makes her feel. She has this stress relieving tactic she does with the blanket where she takes a certain spot on the blanket and rubs it between her thumb and fore finger. I don’t know why she does it, but it calms her nerves, which is helpful when she’s about to have her body ravaged by chemo. Due to its age and condition the doctors will not let the blanket anywhere near her. This breaks my heart. I’ve spent years looking for a replacement, but I’ve frantically been looking the last 6 months. I don’t plan on telling her it’s different. I just plan on telling her I fixed her old one. I need help desperately. Please. I’m looking for anything that could possibly give my daughter any amount of strength to continue to battle the cancer. She loved this blanket more than anything, and any time she ever got sick, even as a young adult, this blanket is what brought her comfort. There are pictures of my daughter being held in this blanket by her great grandmother, who was very close to my daughter. She called her great grandma Grandmamother. And my daughter swears that when she smells her blanket she can still smell Grandmamother on it. Grandmamother passed away 6 years ago. There are toys and things that are special to people, and then there are those certain pieces that come into your life that are more than just an inanimate object…they are a piece of your soul. This blanket is a piece of my daughter’s soul. My daughter needs her soul to be healed right now, and this blanket is the best place to start. Hi there, I am not sure if this is the same blanket or similar, also browse my site and double check all my Winnie the Pooh items. This blanket has the same design. Could it be the one you’re looking for? I almost forgot – the blanket I just linked to was made by Red Calliope, and released as part of the “Pooh 100 Acre Collection”. It was manufactured at the same time as your blanket, and uses the same pattern, so you should be able to use those brand names to help in your search. Do you still have this blanket?